The Rock Creek Edition jazzes up Nissan’s evergreen SUV. Many of the exterior treatments are blacked-out or darkened. The special-edition Pathfinder has a V6 engine with direct injection. Nissan just keeps cranking out the Pathfinder, and why shouldn’t they" I see these things all over the place – yes, I live in a rural area – but the interesting thing is that I still see the original versions from 1987 out there. That’s a testament to durability and longevity that any car maker would love to see. Fast forward to today, and Nissan is rolling out the Pathfinder Rock Creek Edition at the 2019 Chicago Auto Show. The Rock Creek Edition is a package of goodies, not an entirely different truck. But the good thing is that, by putting all these items together, Nissan can cut the price way back. The package runs $995, which saves you a whopping $1,315 against the same equipment if you were to buy them separately. Thank you Nissan! And to make the deal even nicer, the Rock Creek Edition is available on both the SV and SL grades, in both two-wheel and four-wheel drive configurations. So you don’t have to go all top-of-the-line, full-zoot to get the goods. Related: The 2019 Nissan Armada and Frontier receive new upgrades. Nissan Pathfinder Rock Creek Edition. Photo: Nissan North America. Design Treatments: Lots of Black! The differences, exterior wise, between the Rock Creek Edition and the standard Pathfinders are numerous. It starts with the darkened 18-inch wheels and 255/60R18 all-season tires, and ends with a lot of black. The mesh grille, roof rails, door handles, outside mirrors, front and rear fascia accents, and license plate finisher: yes, all black! There are black-molded overfenders and 4WD badges along with unique badging on the front doors. Of course, the inside of the Pathfinder Rock Creek Edition gets some changes and upgrades. Two-tone seating surfaces and badging, for a start, along with high-contrast stitching on those seats. The door cards, console lid, and steering wheel get the stitching treatment too. All 2019 Pathfinder models seat seven. 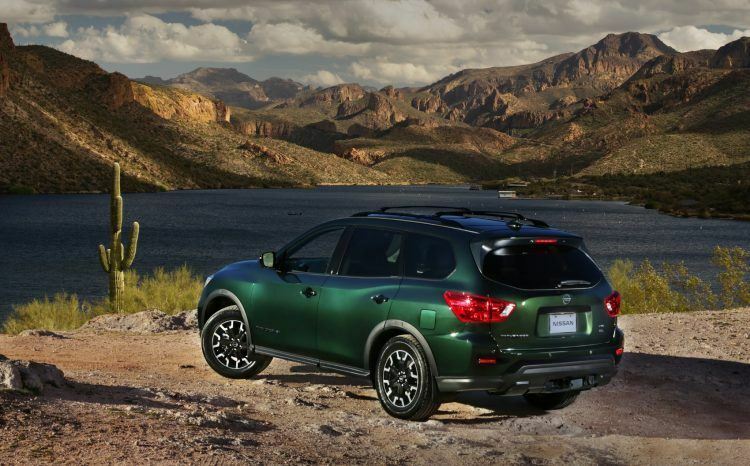 The Pathfinder Rock Creek Edition comes with a metallic interior trim. Apple CarPlay and Android Auto are standard. Photo: Nissan North America. All Pathfinder Rock Creek Editions feature a standard trailer hitch and harness and splash guards. Both the 4WD and 2WD boast an impressive 6,000 lbs. towing capacity. No doubt that’s thanks in large part to the 284 horsepower and 259 lb-ft. of torque coming from the 3.5-liter V6. So yeah, you can haul stuff like your two-axle recreational trailers, jet skis, ATVs, campers, and all your other toys. All 2019 Pathfinder models come with Automatic Emergency Braking. Driving My Mate to his Wedding in a Lamborghini Aventador! !